How is it possible? With the achievements of modern aircraft manufacturing and space technology, the strengthening fibres give us enormous possibilities. If the teeth touching the fibre have no place – in the averse jaw bone – and clink earlier, than a small correction is necessary on the holding teeth. We build in the fibres into the tooth. In terms of correction level, this is much smaller than the ordinary polishing. What is it good for? We can even replace the front teeth if the adjacent teeth are strong enough. 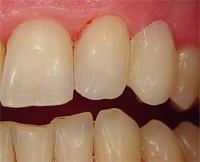 The strengthening fibres can stabilize the loose teeth – these are usually the lower incisors. We extracted the left upper small incisor because the surrounding bone was chronically inflamed. This happened on a Friday afternoon and by Monday evening we had to complete a quality tooth addition... This could not be solved with the long laboratory time that is necessary to produce a dental product. The place of the left side upper incisor has recovered very nicely. The blue stitches are still visible in the gum. The Ribbond™ strengthening ribbons will keep the finished tooth. The ribbons were fixed on the teeth with the specific Artemis™ esthetic filling material. The process took one and a half hour. Our patient was satisfied, because we could fix his smile within a short period of time. The upper left lateral incisor is missing. The canine moved forward. We will reshape the canine and create a lateral incisor and build upm a new canine. The canine moved forward and left an empty space. Face to face the canine is very "Dracula" like. The preparation will reduce the canine to have enough space to build up a lateral incisor. Palatally little cavities are drilled in the teeth to hold the fibers. The Ribbond™ reinforcement fibers hold the unique Artemis™ Aesthetic filling material. The original canine is smaller like a lateral incisor. We built up succesfully a new canine made of Artemis and Ribbond. Please note the excellent realtionshiop of the bridge and the gum.